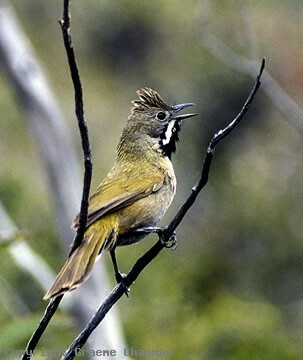 The Western Whipbird is now one of Australia's rarest birds, much sought-after by keen birdwatchers. 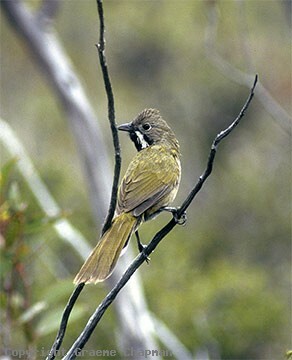 Once well-distributed in north-western Victoria and eastern South Australia, clearing of their mallee habitat and subsequent wildfire has almost wiped them out in that area, leaving only two very small places where they still hang on, one near Meningie and the other in Billiatt Conservation Park. Fortunately, they still persist on Kangaroo Island in dense heath country all along the south side and in S.A. there are two other fairly stable populations in national parks, one at the tip of Yorke Peninsula and the other on Eyre Peninsula in Port Lincoln National Park. Unfortunately the heath country they inhabit in all these places is very fire prone and their future is anything but safe. 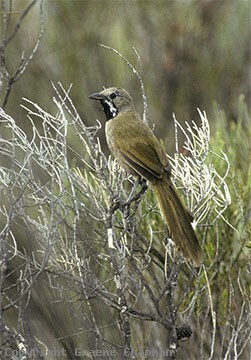 In Western Australia, they are still scattered in several places along the south coast, almost all in National Parks. A popular place to look for them is at Cheynes Beach just east of Albany where the people at the caravan park have a wealth of information about the local birds. 422201-D ... Western Whipbird, Jerramungup, W.A. 422202 ... Western Whipbird, Jerramungup, W.A. 422203 ... Western Whipbird, Jerramungup, W.A. 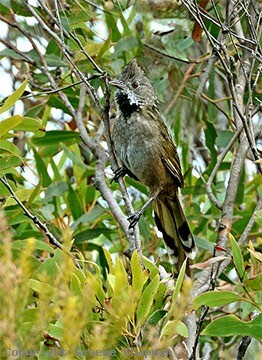 422205-D ... Western Whipbird, D'Estrees Bay, Kangaroo Island.